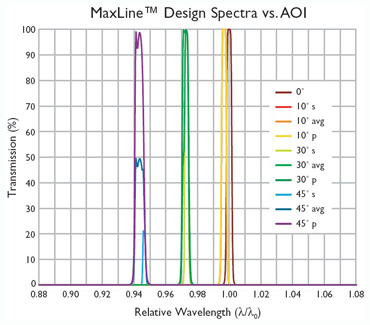 Figure 1: Two distinct filter spectra emerge for s- and p-polarized light as AOI increases. 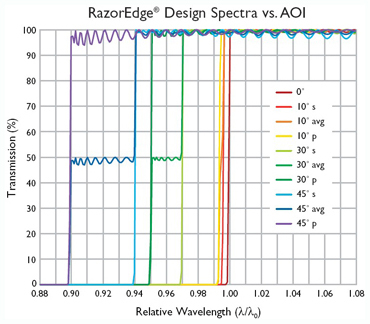 The graph on the right (Figure 1) shows a series of spectra derived from a typical RazorEdge long-wave-pass (LWP) filter design, and can be applied to any of the RazorEdge edge filters. Here, the resulting wavelength λ is compared to the wavelength λ0 of the edge location at normal incidence. As the angle increases from normal incidence, the filter edge shifts toward shorter wavelengths and the edges associated with s- and p-polarized light shift by different amounts. 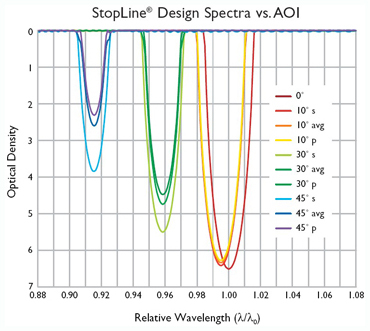 For LWP filters, the response of p-polarized light shifts more than s-polarized light. The opposite is true for SWP filters. This polarization splitting causes the unpolarized spectrum to show a "shelf" near the 50% transmission point, but note that the edge steepness remains intact, even for polarized light. 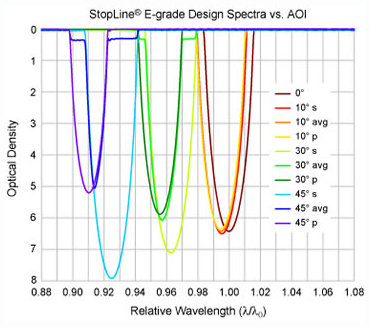 Try angle tuning on selected filters, by using MyLight™. 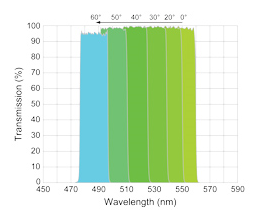 Select your filter and click on the blue "MyLight" button at the top right of the filter spectra to model the theory data at whatever angle you desire.